More ways to use the delicious strawberries sold at the local stand!…. I clipped this recipe out of a Sunset magazine about 20 years ago (22, to be exact). The title is a bit deceiving; you kind of need to push the word ‘nachos’ out of your brain a little. This fresh, healthy dessert tastes nothing like nachos. The similarities are, they both use ‘chips’; and you scoop up the ‘dip’ with them. In this recipe, corn chips are replaced by flour or rice tortillas, veggies for fruit, and the cheese and sour cream, for a creamy, fruity dip. Then, because I am trying to ‘dairy-free’ many of my recipes, I substituted the dip’s cream cheese for Trader Joe’s vegan spread, and swapped the honey out for agave. Both versions are absolutely delicious. You will be pleasantly surprised by how addicting this appetizer is. Double the size of your recipe if you have a lot of people to serve. It will go….FAST! 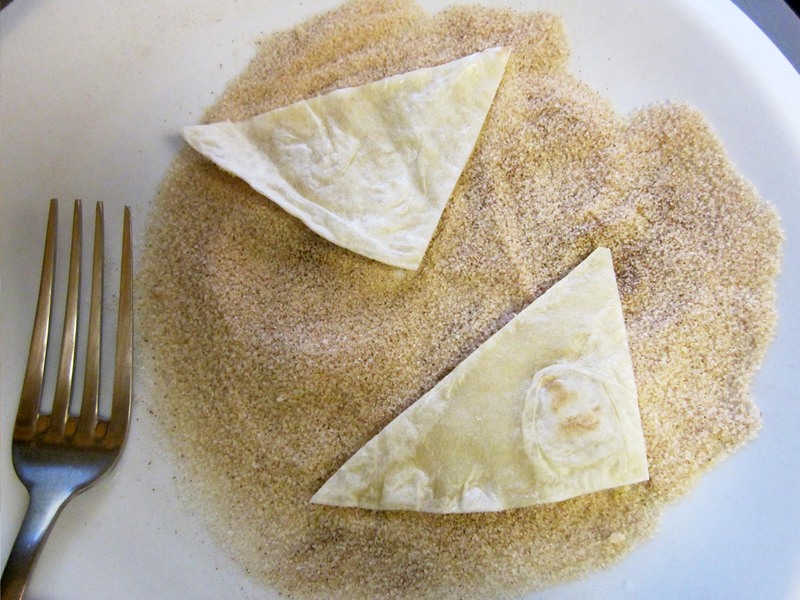 Dip each triangle into cinnamon-sugar, water side down. A fresh, fruity and creamy version of nachos. 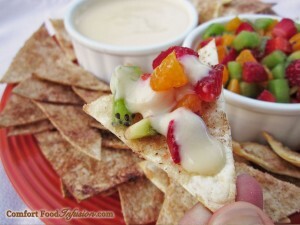 The creamy dip can be made vegan, or with classic cream cheese and honey. 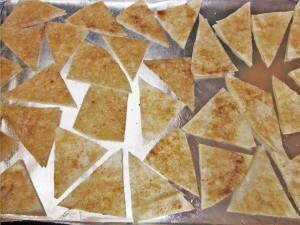 The cinnamon-sugar tortilla chips can be made with brown rice tortillas for a gluten free version. 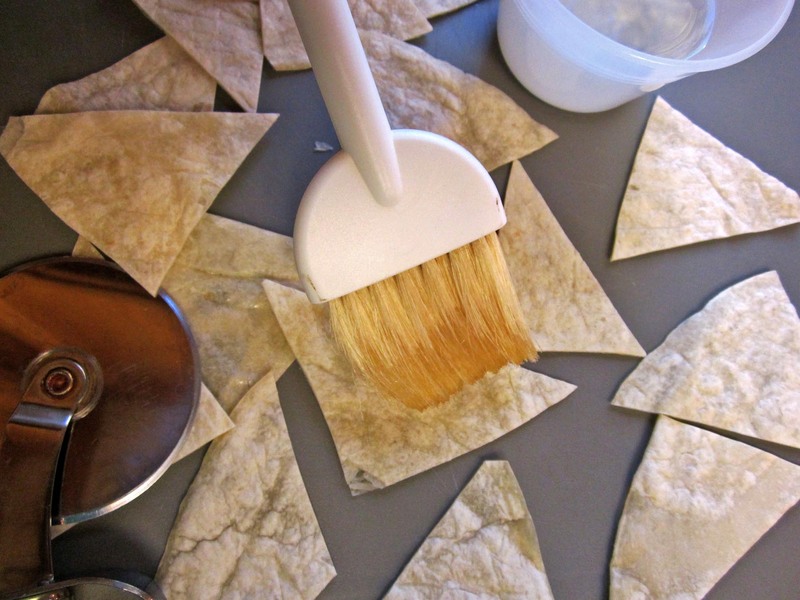 Prepare your working space with- a large cutting board, a pizza slicer or large knife, a small bowl filled with water, and a pastry brush for brushing tortillas with water. Mix sugar and cinnamon in a shallow bowl or a large plate. Working with one tortilla at a time, slice each tortilla into triangles. 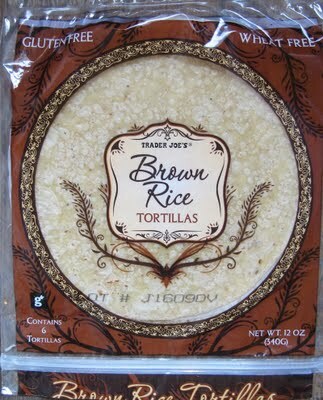 (Any size is fine, I usually get 18-20 triangles per large tortilla). Brush each triangle on one side, lightly, with water. 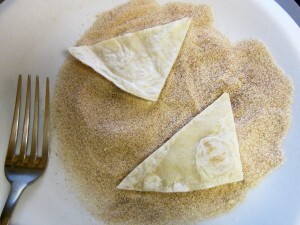 Dip (water side down) into cinnamon-sugar mixture. Shake off excess. 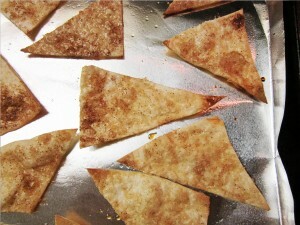 Place tortilla triangles, cinnamon-sugar side up, in a single layer on a tin-foil lined cookie sheet sprayed lightly with non-stick spray. Bake in 500° F oven for 4 to 5 minutes, or until just browned around the edges. Remove baked tortillas to a large bowl lined with paper towels, to cool. Repeat for next batch. This will produce about 4 to 5 cookie sheets worth. Once cooled, the chips can be stored in a large zip-lock bag or plastic container with lid. In a small sauce pan, combine vegan (or non-vegan) cream cheese, orange juice, and agave syrup (or honey). Whisk over low heat until cheese melts and is smooth. (This goes very quickly with the vegan version, and needs very little heat). 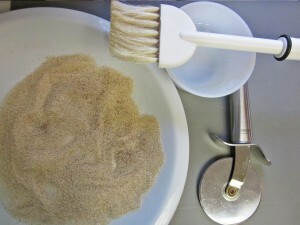 Once blended, remove to cool, and store in refrigerator. Make this last, and shortly before serving- If using canned mandarins, drain well and place on paper towels to absorb even more juice. Dice all fruits and mix gently to combine. Serve chips in a large bowl or platter. 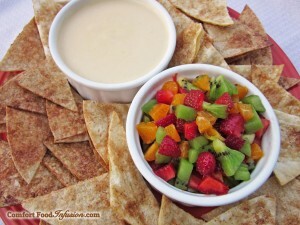 Place fruit salsa and creamy dip into two separate bowls, each with a spoon for easy and clean service. Prepare the same as above. Chips and creamy dip can be made a day or two ahead. Store chips in an airtight bag or container. 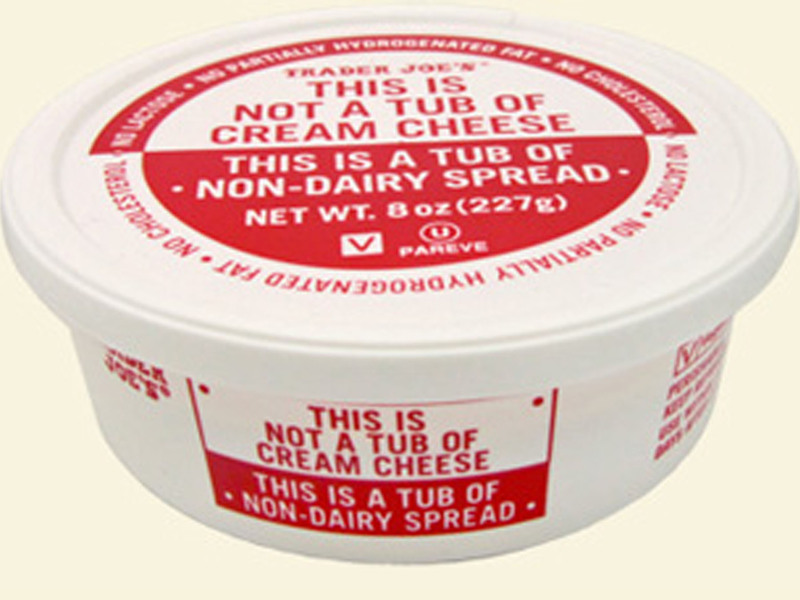 Store creamy dip in a lidded container in refrigerator. Make the fruit dip the day of service. Best not to wait more than an hour or so before serving, as fruit macerates and softens quickly.